This May and June's docket has been filled with couples destined to marry in the Mediterranean Islands. It is amazing to see the varying design challenges they brought to us as we unravel one new project after the other. Our beautiful totes were flying off the shelves (literally). 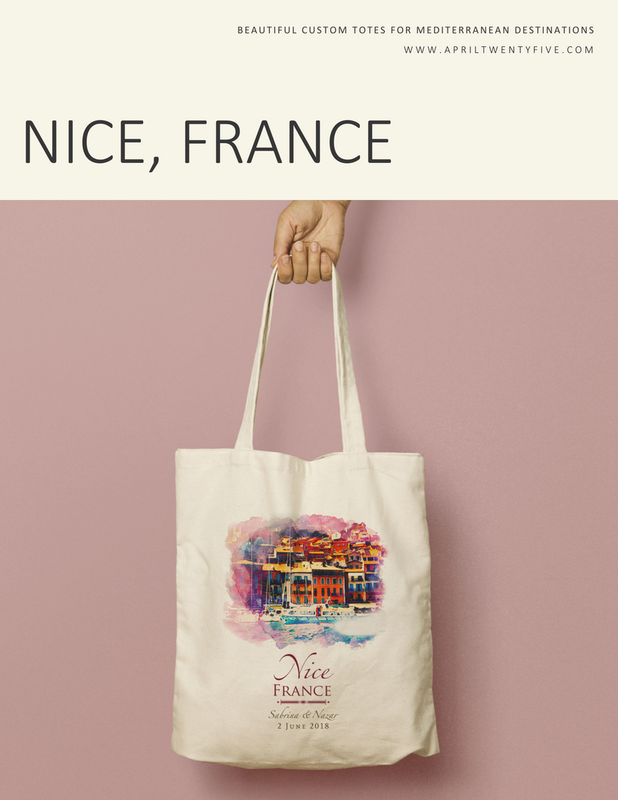 We've only introduced our watercolor designs recently and so far we've booked several tote orders of similar requirements. Here are a few of my favorite versions. The Sabrina tote was a custom order request based on our original Angie design. Sabrina and Nazar were scheduled to have their wedding at the French Riviera (Cote d'Azur), primarily in Old Nice and Cannes. We created 2 watercolor artworks for her this one was of Nice. The Angie Portofino, Italy totes have gained a small fan base since its release. 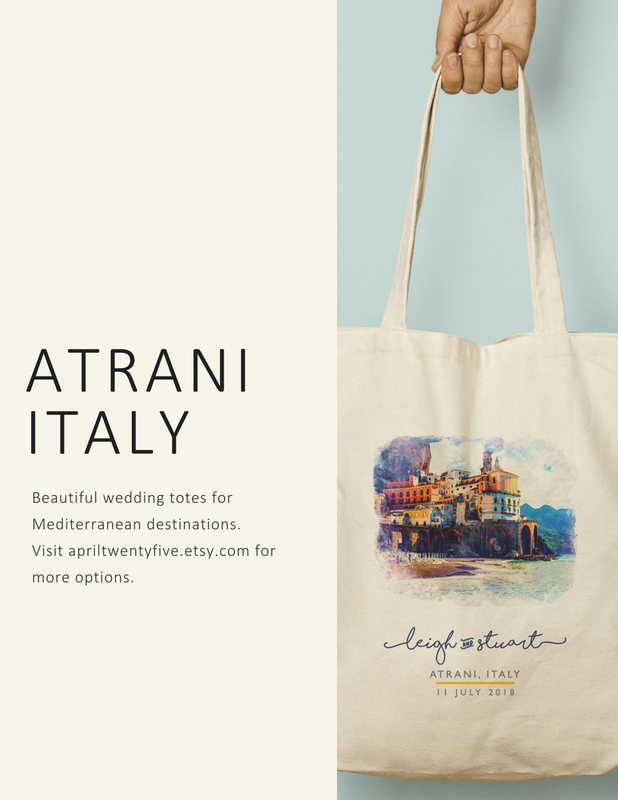 One of its beautiful interpretation was of Leigh and Stuart's Atrani, Italy wedding tote. We found a beautiful photograph of the island at dusk with the sun's beautiful rays just illuminating the magical city on the Amalfi Coast. The photo was translated into a watercolor artwork that incorporated just the right amount of yellows and blues which were the bride and groom's chosen color palette. Josie and Stephen's Greek wedding is set to happen in the beautiful island of Hydra in Greece. Interesting fact, Hydra, Greece is the only Island in Greece where wheels are not allowed. Heavy loads are transported by a mule, hence her special request to incorporate a donkey on the map. 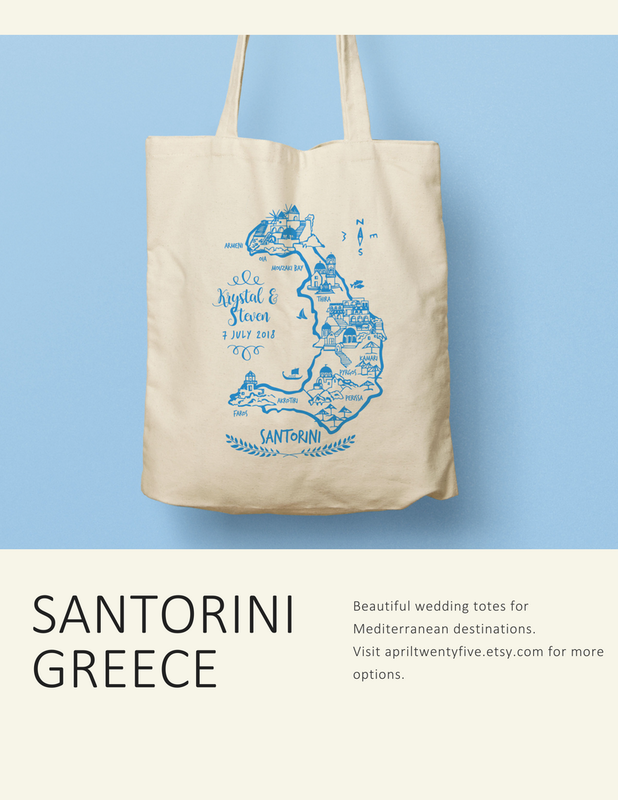 Our newest Greece inspired tote design is of Santorini Greece. 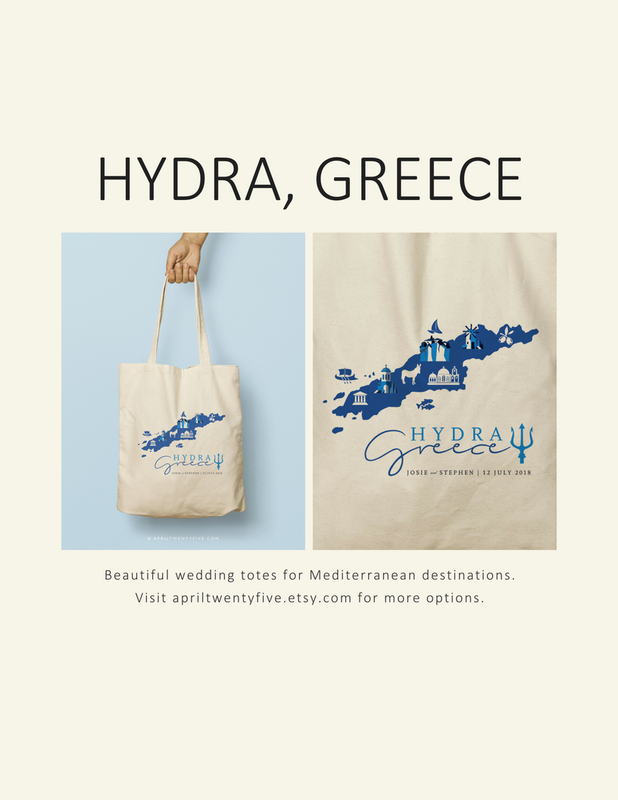 This design features an original illustration of the Greek city's popular architecture. The charm of the Rina tote is in its simplicity. 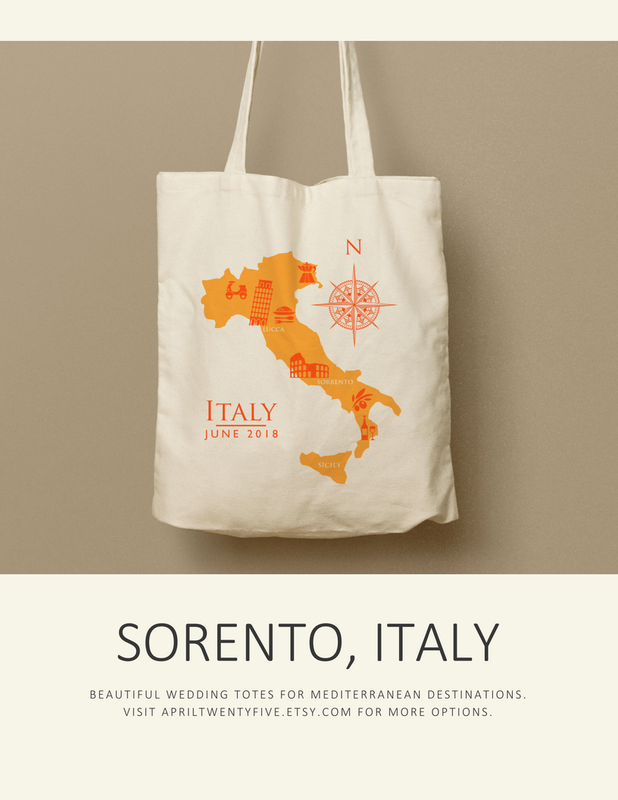 It could work for any Italian destination as it features different icons that country is popular for. This one is an updated version of the design in a different color palette. 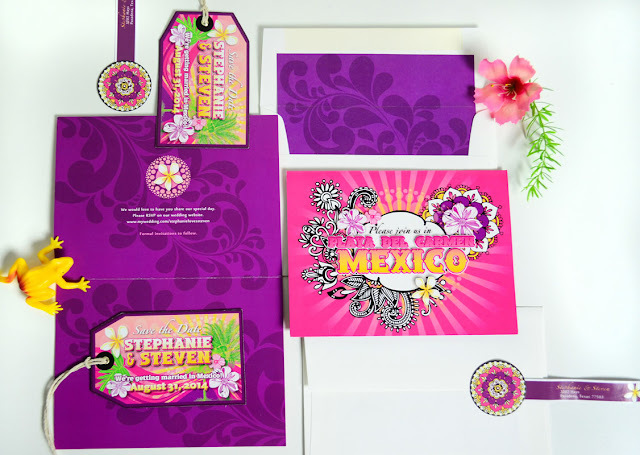 Just like any of our popular designs, everything we offer is completely customizable.